Several people tend to make healthy eating resolutions around the start of a new year…I’m not very good at that so I just consider it a daily struggle, but if you’re one of those normal people, you may enjoy a creamy without containing cream pasta! Bring water to a boil in a medium sized pot. Add pasta and cook according to manufacturer’s directions. While you’re waiting for the water to boil, combine garlic cloves, shallot, lemon juice, and olive oil into a food processor. Process until smooth. Add in avocado, basil, and salt. Process until smooth and creamy. When pasta is done cooking, drain and place in a large bowl. Add avocado sauce and toss to combine. 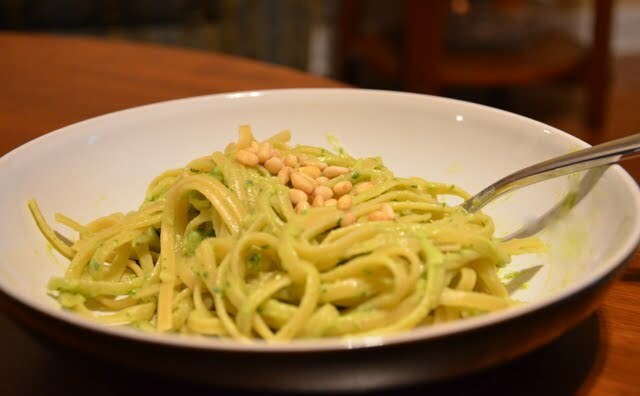 Garnish with lemon zest, pine nuts, and black pepper. Serve immediately (this does not reheat well).